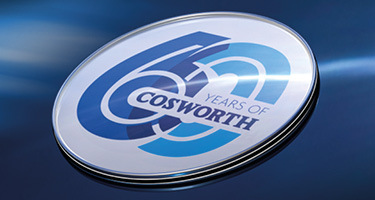 DETROIT, MI – June 25, 2018 – Cosworth, the leading designer and manufacturer of high performance engines and end-to-end automotive technologies, today unveiled its new, state-of-the-art advance manufacturing center and North American Headquarters in Shelby Township, MI. 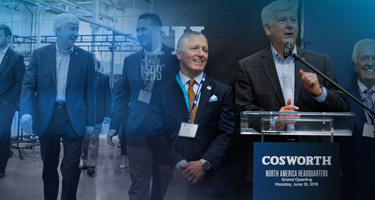 Michigan Governor Rick Snyder, Shelby Township Supervisor Richard Stathakis and other dignitaries were on hand to “push the button” for Cosworth’s advanced manufacturing center – one of the most sophisticated in the world and built for the design and development of the “car of the future” technology. “We warmly welcome Cosworth to Shelby Township and Macomb County as they are a shining example what is driving growth and innovation in advanced automotive manufacturing for the car of the future,” remarked Shelby Township Supervisor Stathakis. Leveraging its longstanding relationships with top-tier global OEMs such as GM, Aston Martin, Honda, Haitec and Porsche, Cosworth recently achieved profitability and reported significant growth including record revenue of US$72.5M for 2017 and record backlog of over US$440 million across long-term contracts. More than 100,000 cars currently on the road in the U.S. are equipped with Cosworth-patented AliveDrive technology that integrates camera sensors, vehicle dynamics data and data analytics software.